If you have a Google Analytics account, you can add Google Analytics tracking to your Mailchimp email campaigns to pass Google data back to your Mailchimp Campaign reports. Set up conversion tracking in Google Analytics to track contacts from clicks to purchases on your website. We can also store your Google Analytics ID to track visits to your campaign pages and hosted campaign archive, so you can see traffic to these pages in your Google Analytics account. In this article, you’ll learn how to add Google Analytics tracking to your email campaigns, archives, and audience pages. This article is about how to add Google Analytics to your email campaigns. To learn about how use Google Analytics on a landing page, check out at our article on that topic. You need an Admin user level or higher to connect this integration. You must have a Google Analytics account to complete this process. To sign up, visit analytics.google.com. When you add Google Analytics tracking to an email campaign, we supply a default title for your campaign that will appear in your Google Analytics account and your tracking URLs. If you choose to edit the default title, make sure you don't include any special characters. These can break your URLs. Google Analytics won't track redirects that don't contain embedded Google Analytics code. To ensure proper tracking, use direct links to pages where Google Analytics code is embedded. We strongly recommend you thoroughly test your campaigns that use Google Analytics tracking to ensure your links function properly. To track only the HTML version of your campaign, and not the plain-text version, you can create a custom tracking code using Google's resources and add it to the HTML of your campaign. If you set up tracking this way, you won't be able to see the Google Analytics statistics in Mailchimp. Google offers several free, online courses designed to help increase your analytics knowledge. For more information on how to set up Google Analytics tracking manually, take a look at Google's help pages for URL building and tagging your links. You'll need to authorize a connection between Mailchimp and a Google Analytics account before you add Google tracking to Campaigns. To connect your Mailchimp account with a Google account, follow these steps. Click to navigate to the Integrations page in your Mailchimp account. Click Google: Analytics, Contacts and Docs. Click Authorize Connection. If you're not already logged into your Google account, you'll be asked to log in. Click Allow to grant Mailchimp access to your Google account. Note: Mailchimp's Google Analytics integration will only use data from your Analytics account. Your contacts, spreadsheets, and mailbox data is not used. You'll return to your Mailchimp account and a success message will appear. Now, you're ready to send an email campaign with Google Analytics tracking. To add Google Analytics tracking to a regular email campaign in Mailchimp, follow these steps. Create a new regular email campaign. In the Settings & Tracking section of the Campaign Builder, check the box next to Google Analytics link tracking. When you check the box to enable tracking, we'll show the campaign title as it will appear in your Google Analytics account after the campaign is sent. The Google Analytics campaign title combines the Mailchimp campaign title with the date to make it easy to search for in your Analytics dashboard. To add Google Analytics tracking to an automated workflow in Mailchimp, follow these steps. Navigate to the Emails step of your automation. Check the box next to Google Analytics link tracking. All emails in an automation series will have the same title in your Google Analytics account unless you set a separate title for each. To set a different title for each email in your automation, follow these steps. Click the title of the email you want to work with. On the Setup step, provide a title for the email in the Google Analytics title for email field. This is the title that will show in your Google Analytics account after the automation is started. Repeat steps 2-3 for each email in your series. To add Google Analytics tracking to your A/B Testing Campaign in Mailchimp, follow these steps. Create an A/B Testing Campaign. Navigate to the Setup step. Under Tracking, click the Google Analytics link tracking box. When you check the box to enable tracking, we'll show the campaign title as it will appear in your Google Analytics account after the campaign is sent. The Google Analytics campaign title combines the Mailchimp campaign title with the date and the Campaign ID. For A/B Testing Campaigns that test content, each combination of the campaign will have a different web ID. Before you send your campaign, make a note of these unique IDs so you'll know which Google Analytics title goes with which combination of your campaign. To find each combination's unique web ID, follow these steps. Create each variation of your campaign. On the Design step in the Content Builder, click the Preview and Test drop-down menu, and choose Enter Preview Mode. Find the unsubscribe link in your campaign, right click, and copy the link address. You'll typically find the unsubscribe link in the footer. Paste the link into a text file, so you can view the entire link, and find the value that follows c= at the end of the link address. Write down this value and the combination title or description it goes with so you can reference it when you view your data in Google Analytics later. 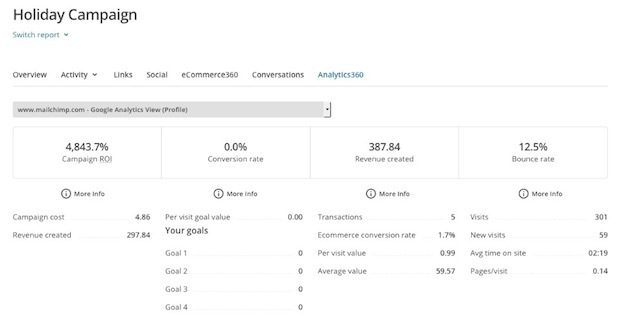 Statistics for campaigns with Google Analytics enabled can be viewed in both your Google Analytics account and in the Analytics360 section of the Mailchimp campaign report. To view the Analytics360 report for a campaign, follow these steps. Click the View report button for the campaign you want to work with. Click the Analytics360 heading at the top of the report to view Google Analytics360 statistics. The statistics in the Analytics360 portion of the campaign report only relate to visitors who entered your website through a link in the email campaign. If the statistics in your Google Analytics account don't match up to the ones in Mailchimp, we're likely still waiting for Google to finish pushing analytics data to your Mailchimp account. The following are definitions of the terminology used on this report. For more information, check out Google's support documentation. Campaign ROI is a percentage based on the cost of the campaign versus the revenue created by the campaign. A conversion is when a visitor completes a goal you've set on your website. The conversion rate is the percentage of site visitors who completed one of the site goals. This value is calculated by adding up all the values for each completed goal, then dividing total by the number of times your site was visited through links in a campaign. We'll list goals you've set for your site and show how many times each have been completed by site visitors. Total dollar value of revenue generated by email readers clicking a link in the email campaign to visit your site and then completing a purchase. Number of completed e-commerce transactions. A transaction is a successful purchase. An e-commerce conversion happens whenever a site visitor makes a purchase. The ecomm conversion rate is the percentage of site visitors who made a purchase. The average value of a visit to your site based on e-commerce revenue. Divide revenue by visits to get the per visit value. Revenue created divided by the number of e-commerce transactions. A bounce is when someone visits your website then exits the site without visiting a second page. Your bounce rate is the percentage of website visitors who did not view a second page. Number of visits to your website referred through this campaign. Number of visitors who have not visited your website previously. Average amount of time a visitor stayed on your website. Average number of pages viewed by each visitor to your website. 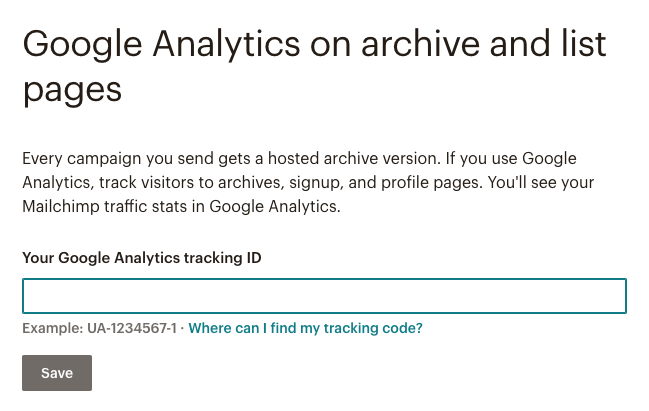 To add Google Analytics tracking to your email campaign archives and pages, follow these steps. Click Google Analytics on archive/list pages. All set! A summary of this traffic is found in your Google Analytics reporting under Traffic Sources. Consider these possibilities if you see behavior you don't expect. Do E-Commerce and Analytics360 data figures not match on your campaign report? Due to the differences in Google Analytics and Mailchimp tracking, it's normal for Analytics360 and E-Commerce revenue figures to vary. For example, Google Analytics makes it optional to include taxes with purchase amounts, and tracks conversions with sessions that end after a period of inactivity. In contrast, Mailchimp doesn't include taxes with purchase amounts in email campaign reports, and continues tracking indefinitely, on a per-contact basis. Was your Google Analytics account set up after the campaign went out? Google Analytics can't work retroactively. The Google Analytics account has to be set up and configured before the tracked campaign is sent. Have you given the reports enough time to populate? It can take up to 36 hours from sending a campaign to see analytics results in the Mailchimp campaign report. Mailchimp pulls Google Analytics data each day at 08:15 UTC (04:15 EST) and takes approximately 24 hours to run. If a campaign was sent close to 08:15 UTC, Google may not have had enough time to populate those results before Mailchimp pulled analytics data, so it could take until the next time data is sent for the data to populate. Is this a new Google Analytics account? We've seen with new accounts it can take a few days to actually have data start populating in the Mailchimp account. This delay can be made worse if the account is set up close to the weekend because sometimes data aggregation slows and gets pulled in on Monday. Is Google Analytics turned on in the campaign? To double check, replicate the campaign and look at the tracking options you selected. Have you tested the Google Analytics URL parameters? Does your website code allow the following external variables? For the sake of page security, a link is designed to fail if a query value outside of what is expected is fed in to a page. This can break your links and disable the tracking if these are not accepted by your website. Did you set a link to a file instead of a page on your website? Is there a space after the URL in your campaign? Google Analytics won't work if there is a space after the URL in the campaign. Is there more than one type of Google Analytics tracking on your links? If you combine Mailchimp's Google Analytics tracking with custom UTM tracking, this could skew results in reports. We recommend choosing only one type of Google Analytics tracking. If you've set up the Google Analytics Integration and sent an analytics-enabled campaign, you can view the results in your Google Analytics account. Enable additional tracking options for campaigns to gain more insight about your subscribers.